Ananya Upcoming Malayalam movies in 2013 is given in this article. There are few interesting films lined up for the actress. Ananaya's new releases in Malayalam are 'The Reporter', 'Thomson Villa' and 'Nadodimannan'. Shooting of her new movies like 'Raktharakshassu 3D' and '100 Degree Celsius' are on the way. Read more to know about the upcoming new Malayalam movies of actress Ananya here. Malayalam actress Ananya has become one of the sought after actress in South Indian movies. With the number of upcoming movies in her kitty the actress has become the most happening actresses in Malayalam. Meanwhile she has also made her presence in other South Indian language films and is busy there too, especially in Kollywood and Sandalwood. Ananya has few interesting films lined up in Malayalam. The upcoming new Malayalam movies of Ananya are 'Nadodimannan', 'Raktharakshassu 3D', 'The Reporter', 'Thomson Villa' and '100 Degree Celsius'. 'Thomson Villa' is ready for its release and will be Anany's next Malayalam movie release. The shooting of other movies are going on and will be released in the near future. Details of Ananaya's upcoming Malayalm movies are given below with emphasize on story, cast and other relevant information. Nadodimannan is the upcoming Malayalam movie of Ananya everybody is waiting with expectation. Ananya essays the role of Dileep's lover in this comedy entertainer. Anany's character in the movie is Meera. Meera is bold but she lives in difficult surroundings and Dileep's character-Padmanabhan always comes in as a helping hand for her. Padmanabhan is the Mayor of Trivandram city. Mythili and Archana Kavi are also part of the main cast in the movie. Padmanabhan is hailed in a village where he used to earn money by participating in the demonstrations conducted by political parties. Later he moves to city and becomes the city Mayor. Archana will appear as Aathira and Mythili as Rima. Rima is a broadcast journalist and she helps him by providing details regarding injustices in the society. 'Nadodimannan' is directed by Viji Thampi and is penned by Krishna Poojappura. Shooting of the movie is going on. Ananya will feature as a wife and a ghost in 'Raktharakshassu 3D'. The movie is directed by a group of young technicians called F-Factor. Sunny Wayne, Madhu and Baby Gowri are part of the main cast in the movie. The story of 'Raktharakshassu 3D' is both interesting and thrilling. It is about a family consisting of a father, mother and a daughter.The father is a famous writer and mother is a fashion designer. Ananya dons the role of this mother.Their daughter is only 7 years old. The family makes a trip to an island and there something more is waiting for them than what they have expected. The mother turns into a raktharekshassu there. With the latest technology and young technicians 'Rektharakshassu 3D' might be able to make people scream in theaters. The captions of the movie have already stirred the horror in the movie. Captions like "Who says it is you who loves your child the most?" and "There is no women in the Earth, who had loved just one man" is pointing towards the theme the movie has in store for viewers. The screenplay is written by Sherin Catherine and story is by Rupesh Paul. 'Raktharakshassu 3D' is produced by 3Dreams International. 'Thomson Villa' is the debut directorial venture of Abin Jacob. The movie is scripted by Dennis Joseph. Ananya appears as the female lead in the movie. Her character in 'Thomson Villa' is Sheelu, the daughter of a business tycoon. Later some misfortunes happening in the business makes her fathers's business collapse. This hard time forces Sheelu to do some job for living. She then moves to Thomson Villa to teach music to Thomson, 6 years old. But her stay at Thomson Villa makes her relazie that there are some mysteries associated with the house. She and her neighbor then try their best to expose these mysteries to the outside world. This is the thread of the thriller 'Thomson Villa'. Other main cast of the movie includes Hemanth and Abin Jacob. The movie will be released soon. 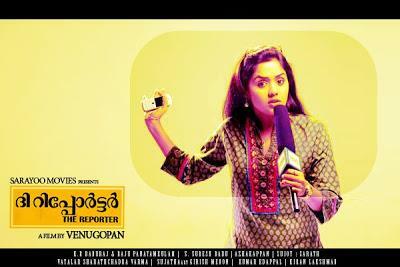 Ananya essays the role of female reporter named Thara Viswanath in this movie. 'The Reporter' is an investigation thriller. Samudhrakani, Kailash and Abhinaya are the other lead cast in the movie. It is directed by Venugopan and is scripted by S Sureshbabu. The producer of this suspense flick is K R Baburaj under Sarayoo Movies. Shooting of 'The Reporter' had started long back and the movie is in post-production works now. '100 Degree Celsius' is a women centric thriller film and is going to be the first Malayalam film released in two parts. Part 1 and Part 2 of '100 Degree Celsius' has the same story carried over from part 1 to part 2. It is directed by Rakesh Gopan and the script is done by Vinu Abraham. The producer of '100 Degree Celsius' is Royson Vellara. Other female leads in the movie are Swetha Menon, Meghna Raj, Bhama and Haritha. The movie is based up on real life incidents and is about five women- housewife, banker, IT professional, TV reporter and a college student. Ananya is roped to do the role of college student in the movie. Her previous outing as a college student in 'Seniors' was one of greatest hit of the year. The shooting of '100 Degree Celsius Part 1' has started in June. '100 Degree Celsius: Part 2' shooting will only start after 6 months from the release of the first part. Other upcoming new films of Ananya announced earlier in Malayalam are 'Dhoore', 'Ameya', 'Achan Balan Makan Bheeman' and 'Sadharanakkaran'. 'Achan Balan Makan Bheeman' is directed by K K Haridas and features Kalabhavan Mani and Undappakru in the lead role. Dhoore is directed by Rohan Krishna. Ananya's filmography is not restricted to Malayalam film industry only. The actress will be seen in upcoming Tamil flicks like 'Iravum Pagalum' and 'Pulivaal' and also in Telugu movie titled 'Intintaa Annamayya'. This charming figure of Malayalam is focusing only on performance oriented roles. This is behind the success of Ananya in Malayalam. When her upcoming movies have the actress featured in the same style fans have many things to hope for in them.